Physiology and Behaviour of Plants looks at plants and how they sense and respond to their environment. 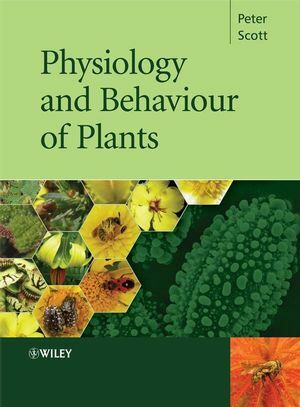 It takes the traditional plant physiology book into a new dimension by demonstrating how the biochemical observations underlie the behaviour of the plant. In many ways the book parallels courses studied at university on animal physiology and behaviour. The plant has to meet the same challenges as an animal to survive, but overcomes these challenges in very different ways. Students learn to think of plants not only as dynamic organisms, but aggressive, territorial organisms capable of long-range communication. This innovative textbook is the ultimate resource for all students in biology, horticulture, forestry and agriculture. Having first been excited by the complexity and beauty of the plant kingdom as a student in Cambridge, Peter Scott is now Senior Lecturer in Plant Biology at the University of Sussex, where his research interests include orchids, resurrection plants and helping students to understand the wonder of the natural world around them. The beginning: the evolution of plants and the major divisions. Floristic kingdoms, Biogeography and Biomes. Structure of the whole plant. Structure of the plant cell. Chapter 2 Photosynthesis the ultimate in autotrophy. Converting light energy into chemical energy. The fate of carbon fixed during photosynthesis. Coping with damage to the phloem. Chapter 4 Roots and the uptake of water. Loading and movement in the xylem. Chapter 5 Mineral nutrition of plants. Soil structure and mineral ions. Function and effects of deficiencies of mineral ions on plants. Chapter 6 Mycorrhizal Associations and Saprophytic Nutrition. Development of the mycorrhizal association. The role of the mycorrhizal association. Parasitic species other than the dicotyledons. Carnivory: the search for a definition. Why have some plants turned to carnivory? Chapter 9 Asexual and Sexual Reproduction. Mechanisms for improving cross fertilisation. Cell division and the cell cycle. Vascular cambium and secondary growth. Plant growth regulators and cell growth. Chapter 12 Plants and stress. Chapter 13 Plant senses and perceiving the world. Table 1. Ratios of red to far-red light in different environments. The data is based on that reported by Hopkins (1999). Chapter 14 Seed dispersal, dormancy and germination. Factors governing dormancy and germination. Chapter 15 Interactions with the Animal Kingdom. Seed dispersal and food reserves: the role of humans. The cell wall as a passive barrier. The cell wall as an active barrier. Poisons by injection or touch. Defence reactions and signal pathways. Mimicry and the enrolment of other organisms for protection. Chapter 17 Plants and Medicines. The origins of antimalarial drugs. St John’s Wort (Hypericum spp.). A cure for certain cancers. Sustainable development of medicines from plants. Chapter 18 Plant Tissue Culture and the Rise of Plant Biotechnology. The development of plant tissue culture media. Types of plant tissue culture. Applications of plant tissue culture. Insect mimicry in the Orchidaceae. The oldest and biggest plants in the world. Welwitschia mirabilis and Ephedra viridis.